Heavy duty Free-Standing Rotary Mail Centers are convenient when space is limited and a professional mailbox system is desired. A matching rear cover (related item #3125) is available as an option upon request. Private access Free-Standing Rotary Mail Centers include a master commercial lock with two (2) keys. To operate, the user unlocks the unit and rotates the inner cabinet 180 degrees so that the rear of the mailboxes are facing the front. After distributing the mail, the inner cabinet is rotated back 180 degrees to the box holder access position. 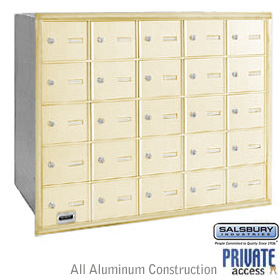 Aluminum style Free-Standing Rotary Mail Centers (#3100) are designed to accommodate a combination of five (5) aluminum rack ladder system mailboxes and data distribution system boxes. ORDER MAILBOXES SEPARATELY.